Once and for all we are staking our claim that the centering measurement standards for this card are in direct conflict with the cards overall eye appeal and attractiveness. What we have here is a card that for all intensive purposes appears virtually dead centered, yet has received a head-scratching centering subgrade of just an '8'. Just 8.5 on centering would render this card a MINT 9 which has a market value over $40,000. 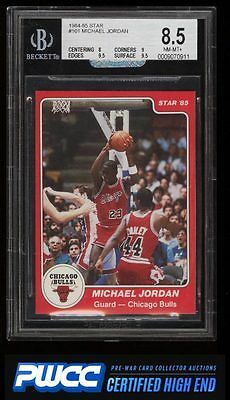 Hands down one of the nicest '84-85 Star Michael Jordan rookies we've brokered in our tenure. The corners are extremely sharp and the card stock is virtually GEM MINT. As fine as they come and an outright steal for the assigned technical assessment. One of nearly 20,000 cards, lots, and sets up for bid in our 7th Auction of 2016. Click on the link above to view the other PWCC auction lots.